Much of North America is experiencing colder than expected temperatures this week; if your fuel is not protected, winter weather could wreak havoc on your operability. Low temperatures have been particularly acute in the Midwest and Northeast United States, where Mansfield has noted increased winter operability concerns. Fuel tests in areas such as Kansas and Missouri have revealed fuel cloud points in the mid-teens Farenheit, which are above the preferred levels for winter months. 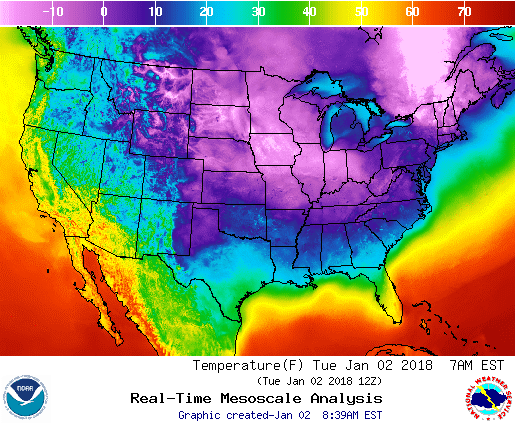 Normally, winter fuel above the Mason-Dixon line has a cloud point below 10° F. Those extra few degrees make a significant difference for fleets, especially with winter temperatures dropping to -10° and below in some areas. The higher cloud point, mixed with extremely cold temperatures, is a recipe for fuel gelling and operability concerns. Mansfield is committed to ensuring our customers maintain operability. Contact your customer service representative for recommended winter fuel procedures specific to your location. Keep engines heated while not in service to avoid freezing – Diesel fuel can freeze in your equipment during cold weather. Avoid freezing by leaving equipment running overnight, parking indoors, or by using block heaters or thermal blankets to keep engines warm. Monitor road conditions – If winter conditions include ice and snow, make sure drivers are equipped for winter conditions or stay off the road. Icy roads can be extremely dangerous for drivers and equipment. Ensure fuel is treated appropriately – Have winter additives such as ColdPRO available for vehicles fueling over the road, and keep emergency re-liquefiers with your vehicles. Additionally, ordering pre-treated fuel or fuel blended with kerosene can also improve winter operability. Click Here to learn more about winter fuel additive solutions.